In 1894 W. B. Baldwin spent $8,000 to build his new two-story brick stable at No. 205 West 77th Street. The significant outlay suggests that the stable was a fine building. But it would not last long. The city soon acquired Nos. 205 and 207 West 77th Street in a condemnation procedure. Baldwin was probably not overly put out. The awards and costs to the city amounted to $34,468.70 for both properties. On January 2, 1900 the titles were passed to Fire Department. 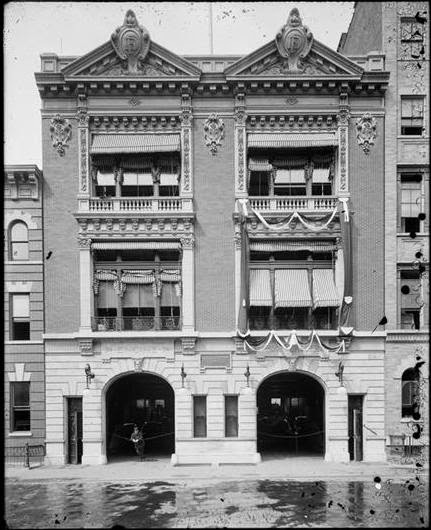 From 1879 to 1895 Napoleon LeBrun was responsible for designing New York’s fire houses. Two years later Tammany Hall chose the relatively obscure team of Vincent Slattery and Arthur Horgan to design selected civic structures. The West 77th Street station would be counted among them. Newspaper accounts more than hinted that Horgan & Slattery were deeply involved with the Tammany corruption and graft. By December 1901 the combined fire house for Hook and Ladder 25 at No. 205, and Engine Company 74 at No. 207 was completed. The Report of the Buildings Superintendent listed the cost of construction at $57,675.00—about $1.5 million by today’s standards. More attractive than their own character was the architects’ design for Engine Company 74 and Hook & Ladder 25. Brick and limestone came together in an double Italianate palazzo with Beaux Arts splashes. Recessed balconies provided an elegant air and triangular pediments above the cornice bore giant shields with the Fire Department monogram. The work of turn-of-the-century firemen was especially dangerous. The majority of buildings were still lit by gas; getting to a fire on streets with little traffic control, teeming with street cars, carriages, pedestrians and automobiles was treacherous; and buildings were constructed with few regulations. The year 1904 was a fearful example. On February 9 the firemen were rushing to a fire in a 4-story brownstone at 95th Street and Columbus Avenue. 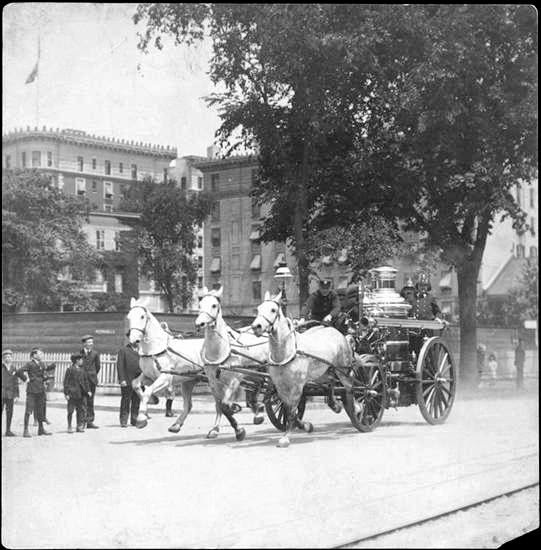 The hook and ladder truck, the chief’s buggy, the fire engine and the tender had to cross the street car tracks on Columbus Avenue. A streetcar heading north came to an abrupt and unexpected halt. Bystanders took the two injured firemen into a drug store while the rest of the crew rushed to the fire. The men were removed to Roosevelt Hospital. Rather fearsome faces adorn the keystones of the truck bays. 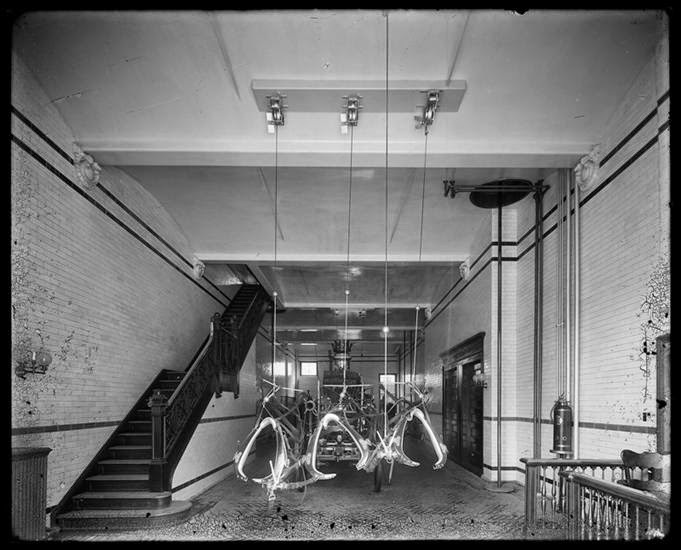 Four months later, on June 13, 1904 the men of Hook & Ladder 25 headed to a fire in the six story building of the New York College of Pharmacy on West 68th Street. The fire started when a five-gallon container of nitric acid, packed in straw and sawdust, cracked in the cellar. “This caused almost immediate combustion, and the packing burst into flames,” explained the New-York Tribune the following day. Firemen were able to extinguish the flames; but the fumes of the nitric acid had filled the cellar and risen to the upper floors. Captain P. J. Graham took several men upstairs to search for fire and to open windows. As firemen continued to try to rescue their comrades, they too fell victim to the noxious fumes, until six men lay on the floor unconscious. Finally, “with difficulty, on account of the fumes,” all the men were pulled to safety and were revived. In March 1906, according to The City Record, “additions and alterations to quarters of Engine Company 74 and Hook and Ladder Company 25” were done. Apparently the changes were made to the interior or to the rear; for the façade was unaltered. Nearby at Nos. 219 through 223 West 77th Street was the five-story stable and “district station” of the Department of Street Cleaning. The firemen noticed fire in the building on July 29, 1910 at the same time that Patrolmen Kear and Blass, passing by, saw it. The policemen sent in an alarm and the fire fighters rushed to the blaze. The stubborn blaze had already encompassed the third floor and soon reached the fourth. The fourth and fifth floors were used for storing hay and supplies, adding to the fury of the flames. While the fire fighters fought the conflagration, which now was spreading to the fifth floor and punching through the roof, the policemen from the West 68th Street Station turned their attention to the 81 horses inside. “They ran to the basement, where some of the animals were, and succeeded in getting them up a runway to the street level, where they were driven out by the liberal use of the officers’ nightsticks. Then the rescuers ran upstairs to the first floor and got out a number of horses quartered there. These animals were also drive to the street in safety,” said the New-York Tribune. The fire was extinguished after about an hour of “hard fighting” and now the police were taxed with what the Tribune called “a round-up” of the horses. All but five were caught. In 1916 Fire Commissioner Adamson sought to modernize the Fire Department with “motor apparatus.” He told reporters that “tractor engines and hook and ladder trucks” would be a cost savings because they would be maintained and operated at a third of the cost of horse-drawn equipment. Engine Company 74 was among the first to have engine modified with a gasoline motor. “The front wheels of horse-drawn engines and hook and ladder trucks are being taken off and a two-wheel motor substituted at a cost of $3,600,” explained The New York Times on July 4, 1916. The Commissioner added that replacing the 803 horses that still lived in firehouses would be of service to the fire fighters who shared their living space. The janitor, Max Blumenberg, who found the blaze in the cellar around 7 a.m. was afraid of panicking the patients so he attempted to put out the fire himself rather than send an alarm. It was a mistake. The fire got out of hand and spread to a ventilation shaft leading to the roof. There were no fire escapes on the 77th Street side of the building and nurses and patients were clustered at the windows when Hook & Ladder Company No. 25 arrived. Ladders were raised to the upper floors and one-by-one those trapped inside were rescued. Other fire fighters rushed inside to pull patients out who could not be reached by ladders. There were no injuries or fatalities that day. Hook & Ladder Company No. 25 received its 30 minutes of fame in 1956 when a color television movie entitled F.D.N.Y was filmed. The New York Times, saying that the Fire Department “sometimes considers itself the forgotten service among those protecting New York,” explained that the movie—to be aired on local channels—would help citizens understand the work of the Department. “The picture will show the selection, training, work and home life of the firemen,” it wrote. The men of Hook & Ladder No. 25 were used as actors in the simulation of a rescue. The darkest day for the men stationed here came on September 11, 2001. In the monstrous attack on the World Trade Center buildings Ladder Company 25 lost six brave souls: Matthew Barnes, John Collins, Kenneth Kumpel, Robert Minara, Joseph Rivelli, Jr., and Paul Ruback. In 2003 a refurbishing of the century-old structure was necessary. Sometime around 1975 the flamboyant cornice was removed; no doubt because of danger due to disrepair. Now the weight of modern fire equipment threatened the integrity of the main floor. A $4 million renovation was initiated under the supervision of architect David Prendergrast. Simple arched pediments replace the missing cornice. The flaming torch in the carved cartouche is a fire department symbol. The result was a restored façade that preserved Horgan & Slattery’s opulent design. Prendergrast replaced the missing cornice with shallow arched pediments that compliment the design. While the dealings between Tammany Hall and the architects may have been shady, the result is a handsome remnant of the turn of the century on the Upper West Side.